Home is where the heart is, isn’t it? Ever thought about those who have no home and make us feel good day as we enjoy their music and admire their beauty. Shouldn’t they also have a beautiful place of their own? Yes, we are talking about the birds whose melodies we wake to every morning and who warm our hearts. These pretty creatures have their nests perched on trees and shrubs. However, when the humans have started keeping birds as pets, the pretty birds do not have the luxury of having their own nests. This is how the concept of birdcages came into being. Since birdcages are the only option that we humans have for them, why not make it beautiful? There are many kinds of birdcages available t day for the birds. Since birds can be classified into three sizes, small, medium and large, cages are also provided in the same way (i.e., small, medium, and large). It is true that no one else but you knows the best your bird requires, so you’re always advised to get your birdcage designed as an acrylic bird cage which is ideal for any bird that you may own. 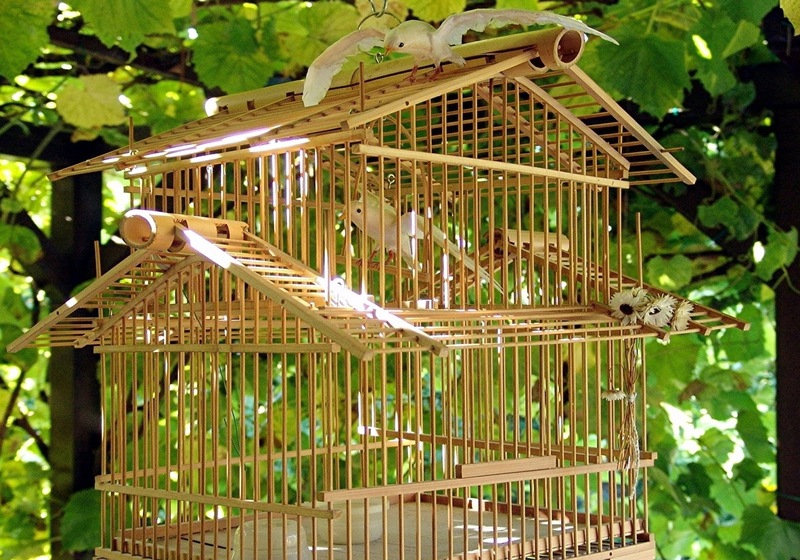 The birdcages come in a variety of designs and materials, including the manzanita, ribbonwood, grape wood and acrylic perches. Aside from that, you can buy bird toys for your bird/s to play with. You can also make sure they have a wide variety of food to eat. Select the birdcage that’s easy to clean. For this, you can place a tray into the cage, which you can remove easily when you need to wash it off. You can also make sure your birds get their well-deserved rest by purchasing a cover to place over their cage at night. You can buy lots of toys and hanging materials to enhance the looks and charm of their home. For example, you can give put a ladder in their cage that they can walk up and down on. This is just one of many ways to keep them from getting bored and enjoying their home. Your birds are special to you, so they deserve a special home. People who decide to have pets at home should provide suitable housing for the animal. This means getting one that is proportional to the size and type of parrot because this will greatly affect the lifespan of the bird. It is advisable to get one that is very large. Most of these birds prefer to climb, stretch and play so there must be enough space for the parrot to do this inside instead of it just sitting on a perch located inside the cage. The housing should have horizontal bars. This will make it easy for the parrot to grab hold onto the sides whenever it feels like climbing inside the cage. The distance between each bar should also be checked so that the bird will not injure itself during this activity. Though its true there are some cheap cages that can be found in the market, the owner must not get this based on these criteria alone. This is because the material used in making the cage will not be of good quality that may also pose a danger for the parrot. It is better than to get an expensive one made of stainless steel or powder coated since these are not toxic to the pet. Conventional bird cages have doors and latches. People who decide to get a parrot should avoid using this because it can cause injury to the creature’s beak, head, neck or wing. The best to get those are those that are detachable since this has been proven to be safe. Most animals produce waste. The ideal carrot cage should have a pull-out tray in the bottom so the owner can just take this off and wash it before putting it back inside. This is better than going inside and to clear the housing of droppings, which will take a long time to clean. The parrot cage should come to have a designated area where the bowl will be placed. Some manufacturers sell this with a plate inside while others have to be purchased separately. This should also be removable because this needs to be cleaned twice a day before and after feeding. The perch where the parrot sits must be near where the food is located. This will make it easy for the bird to go to when it is time for feeding. Having a pet big or small is an enormous responsibility. The individual should have a spacious and safe cage to enjoy many years with the parrot. One of the most vital things you need to remember in keeping Lovebirds is the Lovebird cages. The birdhouse should be with suitable and proper size for your loved Lovebirds. Your Lovebird cages should have sufficient room for your Lovebirds to fly openly. A cage 2 feet by 2 feet is sufficiently big for a single Lovebird, but you should purchase a larger one that's even better. Ensure that the Lovebird cages you are purchasing are those that have bars that are close together. These cuties can occasionally be like Houdini who can squeeze themselves out of the cage, and voila, they fly away, rejoicing the taste of liberty. Also ensure that the door latches are well secured, picking locks is another one of their specialty. As you already know, Lovebirds like to fly round and round, they also like to climb backward and forwards in their cages. It might be a good idea to provide your Lovebird cages with nice cozy perches. Good perches are a vital component in a lovebird's cage as they spend a heap of time standing on their feet. You may need to avoid choosing unvarying diameters of perches in your Lovebird cages for they may lead to injuries, the foot gets held up in the same position, and they get nearly no exercise and always have pressure points in the same location. You need to have at least 2 perches in your Lovebird cages with varying diameter.Swinging perches could be a nice option, for your Lovebirds will enjoy them. Swings, ladders and interlocked bamboos are a favorite. Cleaning your cages can initially be a tedious responsibility. Having so many bars, cracks, and openings to clean, it can be tough for new Lovebird owners to work out where to begin. The crevices and cracks provide a perfect place for germs to swarm and as a Lovebird owner, you do not want germs prospering in your cages. Setting and sticking to a cleaning schedule for your cages is crucial to holding down your job as simple as possible. Breaking down the method into easy jobs each day, week, and month not only saves your resources but makes sure that your bird always has a clean and comfy cage to live in. Cleaning must be done to attenuate your Lovebird's likelihood of infection. Obviously, grimy Lovebird cages can end up in a large number of significant health problems in your Lovebirds. You've got to wash the liners, clean the food and water dishes, wipe down surfaces, including bars, perches, and toys, change the perches and revolve the toys, when washing the cage parts confirm it is totally dried. Wet surfaces on your Lovebird cages can wet your Lovebirds and they easily catch a cold. Maintaining a clean environment for your pet takes just a couple of minutes a day, but can potentially add years to your Lovebird's life. Do your part to make certain that your beloved pets stay ecstatic and comfortable by keeping their Lovebird cages fresh, clean, and in shipshape. Elise Gonzalez is a lovebird expert. Do You Want To Know How To Take Care Of Your Lovebird & Build Great Friendship With Your Bird? 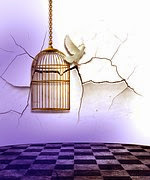 Discover more information about Lovebird Cages, visit http://www.lovebirdscaresecrets.com. Parakeet parrots are one of the most popular and sought-after types of parrots. When many people speak about owning a pet parrot, they think of a parakeet. Parakeets are small to medium in size and have long tails. If you're considering a parakeet parrot as a pet, there are some important factors to consider when purchasing their birdcage to ensure happy and healthy birds. Generally speaking, parakeet parrots can be smaller than most other types of parrots, but they should still live in a decent size birdcage no smaller than 24" x 16" x 16". Your pet parakeets will require space to spread their wings. You'll also need to consider your birds' wingspan when purchasing a new cage. It is bad for your parakeet to have their wings or tail brush against the cage when they try to extend their wings. This has both a physical and mental effect on the birds over time. It is best to purchase the largest birdcage you can afford and have space for in your home. Due to the fact that parakeet parrots enjoy nesting with one another, you can keep two or three parakeets in a larger cage. Some parakeet cages have many water and feeding bowls to accommodate for many parakeets. It is, however, important to not have parakeets living with other kinds of parrots to prevent behavioral issues. It is important to remember that parakeets enjoy and benefit more from cages which are wider than taller since parakeet parrots tend to fly back and forth more than up and down. 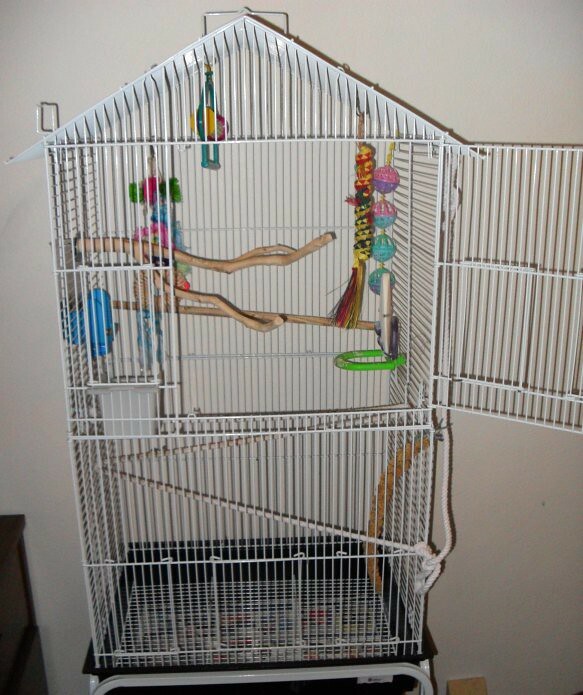 If your cage is too tall, the space in the upper part of the cage can be wasted, but if you install perches or branches in the cage, this can encourage climbing. Having a wide cage in which one side is against the wall makes the parakeet most comfortable. Interestingly enough, experts have said that a round cage isn't ideal for parakeets. Since parakeets tend to be a smaller variety of parrots, you'll want bars on your birdcage that are not spaced more than 0.5" apart. If the spaces are any wider, your parakeet will be tempted to push their head though with the potential of getting stuck. Some experts say that it is recommended that the parakeet parrot birdcage have one or two cage walls that have horizontal bars instead of vertical bars to give them the opportunity to climb. It has been said that stainless steel birdcages are the best material for your parakeet, along with wrought iron and cold rolled steel. The reason stainless steel is so popular is that it is easy to maintain and tends to resist rust. Certain materials can be toxic for your parakeet parrots such as lead, galvanized steel, zinc, and brass. Since parakeets enjoy exploring and chewing, they could have the potential to ingest metal or have metal flakes get in their eyes. You'll want to seek out a birdcage that is naturally treated rather than ones with too many chemicals added. Taking these four tips to heart when searching for and purchasing your new parakeet parrot birdcage will help you make the safe and most comforting decision for your bird. Don't you just hate it when you have to clean your feathered friends' home frequently because of all the food morsels and droppings, which seem to pop up every minute? If this is a problem for you, then you may want to consider trying some bird cage liners, which offer the house protection from both the inside and the outside. These materials are an ideal substitute to bedding and decorative substrates, which are tedious in nature, in terms of the maintenance and replacements. Here are some reasons why these bird supplies are more convenient to utilize than other cleaning products. 1. Of course, one of the main reasons why consumers love to avail of these bird cage liners is because of its affordable price. In spite of the fact that it is meant to be disposable, you are guaranteed that you can use it a couple of times before throwing it into the trash. 2. This is quite easy to use in the sense that you are always given a size, which will surely fit the measurements of your bird cages. The liners are normally made from heavy-duty plastic, which has the same texture as that of a tarpaulin. You are given the freedom to cut it down to the exact dimension, which you like, as well. 3. As mentioned above, the liners are not difficult to use, in the sense that it will only take you about a minute to set it up, and just a few seconds to remove it. What you have to do is lay this product at the very base of the cage, being careful to use it as a secondary flooring. At the end of each day, you can just lift it up by the ends, securing the mess within it, and dispose of the entire plastic along with the food morsels and droppings. 4. These liners often come in a set, which includes a counterpart covering that you can use to envelop the exterior of the cage, giving you the opportunity to keep your feathered friends cool and away from the sun during the afternoons. Overall, these bird cage liners are a great addition to your must-have items, since it will not only make sure that your feathered friends' home is clean, but it also ensures that you will have an easier time in maintenance. Plus, its other features benefit the health of your pals greatly, too. Author has 5 years' experience in content writing. Bird supplies do not need to put a strain on your budget if you simply know how to improvise with the items that you have at home. Never the less that the bird cage is new , and the perches are ecologically clean , they should be disinfected carefully . I call this operation “carbonation ”, because as a “disinfectant” gas for burning is used , and gas for cigarette lighters can be used but it can be quite expensive . Wash both the bird cage and the wooden sticks with soap and hot water. Leave them dry well especially the sticks because they soak with water and drench. Prepare the gas and a cloth with which to put the gas over the perches and the bird cage. It is compulsory to put gloves ( surgery or household for washing plates ), otherwise you hands will smell awful. Slightly damp the cloth , but not to drop gas from it , and carefully rub the bird cage everywhere and the perches . Now the bird cage and the perches are absolutely ready to be completed and to put the bird inside . The disinfection is very useful for the bird because when it steps on the “ carbonated ” perches , a part of the gas gets soaked into its legs and then when scouring themselves it goes on its feathers. It is good at least once or twice to clean the perches with gas and to change them. That is why I told you in the beginning to provide yourselves with wooden sticks . o clean the bird cage with gas is more difficult , because you are supposed to have a spare ” lodging ” for the bird, where to put it temporarily . Nothing prevents you from cleaning the bird cage periodically with a cloth damped with gas without washing it with soap .